If you’re unfamiliar with the Galahad series, this is where it all starts. Tor Books packaged all six Galahad novels into three archives, each containing two full novels. 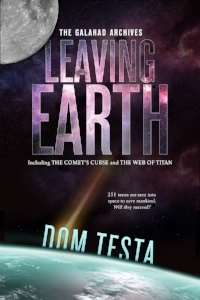 This volume, Leaving Earth, delivers the first two books in the series, The Comet’s Curse and The Web of Titan. If you’re ready to take off on a rollicking adventure, this is where you strap yourself in. And, once you finish, look for The Galahad Archives Vol. 2 and Vol. 3. Use my Amazon affiliate link below to order your copy today! A three-time winner of Best Young Adult Book and a Top-Shelf selection by the American Library Association, the Galahad saga is a rollicking adventure series set aboard a spacecraft hurtling through deep space. With 251 teenagers and one remarkable AI guardian/mentor named Roc, this three-volume/six-book series is fun for both young adults and young-at-heart adults who enjoy a bit of mystery and romance tucked into their SciFi. Prepare for liftoff right here. 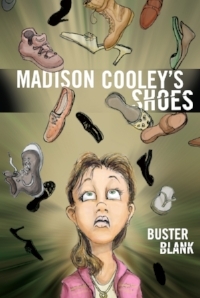 When writing for middle-grade students (grades 4-6), I take on the persona of Buster Blank. One librarian described these quirky tales as “The Twilight Zone for kids.” Three books, three fascinating tales, and hours of fun. Check out all three right here, and prepare for the fourth Buster Blank book, Bolly Higgins, coming soon. After selling thousands of copies, the Mindbender series welcomed Volume 4 in 2018. 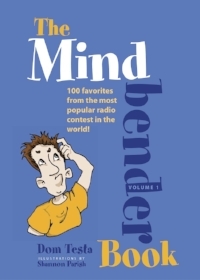 Each book contains 100 classic Mindbenders, as heard on the Dom and Jeremy Show on Mix 100 in Denver. Just the right price and the right size for gift-giving and stocking-stuffing. Check out the entire collection right here. I knew I wanted to write and publish when I was a teenager. And yet I waited many years before I even tried to get a book published. Don’t make the same mistakes I did. Don’t let fears and doubts keep you from getting your words out there. 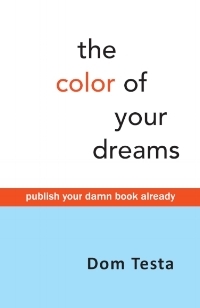 The Color of Your Dreams can help. Get inspired right here. 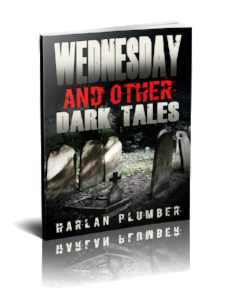 When I create dark/creepy fiction for adults (certainly not for kids) I often write under the name Harlan Plumber. This collection of short fiction is named after the lead story, Wednesday, which I actually wrote about 25 years ago. Find out more about Wednesday, and Other Dark Tales right here. Find your copy right here.